Saturday Indesign 2015, Sydney, Australia. Design fairs in Australia will never be able to compete in size or razzle dazzle with fairs like Milan or London but Saturday Indesign, which occurs every second year in Sydney, is an important event on the Australian design calendar. Now in its 15th year, the current form of the SID event combines a central ‘Galleria’ destination with participating showrooms in the nearby suburbs accessed by a continuous bus service that takes visitors from one group of showrooms to the next. The result is three days of wandering around bumping into friends and associates at different venues and catching up on all the new things and plenty of industry gossip. While many of the early prototypes of new designs may have been launched months ago at the big fairs, Saturday Indesign is a chance to see and touch the production versions and to experience plenty of great new product from local designers. Ode ceramics at Side Project: Music for your Eyes - on show at The Stables in Surry Hills. This year saw a much greater emphasis on providing genuine hospitality. Some of the showrooms, such as Living Edge and Seeho Su, went all out providing amazing food and drink for anyone who popped in over the three days. Others transformed their showrooms through innovative installations or careful styling making a visit to a regular haunt an exciting new experience. The Euroluce showroom under a cloak of rubbery black fabric. Black & white images of a girl entangled in cable continued the theme. Shown are Michael Anastassiades 'IC' lights for Flos. Anastasia's' 'String' lamp for Flos revealed. Lighting specialist Euroluce was one such showroom who reinvented itself for the three day event. Swathed in a rubbery black fabric, the space was turned over to an exclusive showing of new lighting from Flos – in particular the pieces from Michael Anastassiades such as ‘String’ and ‘IC’ but also ‘OK’ from Konstantin Gric and ‘Aim’ by the Bouroullec brothers. Outside in the Hill St precinct courtyard, Workshopped, Arthur G and Euroluce plus the Whitehouse Insitute of Design and Luxmy Furniture had heaped a mass of replica furniture pieces into a crazy funeral pyre. The symbolic bonfire couldn’t be lit unfortunately (due to the toxic smoke that would have emanated) but the message was received loud and clear by all the visitors: replica furniture has NO value. The Hill st Authentic funeral pyre for a tawdry selection of replica rubbish. Just around the corner from the Hill St was a brilliant curated show hosted by The Stables called Side Project: Music for your eyes. With a veritable who’s who of the more alternative end of the Australian design community, the show included work by Daniel Emma, Blakebrough + King, Studio Kyss, Porcelain Bear, Henry Wilson and Jonathan Zawada along with many others. 'Zig Zag' side table by Page Thirty Three - artworks by Tin & Ed. Of particular interest for me were the new pieces by Page Thirty Three called 'Tactile Equations'. These new items included an awesome coffee table of folded brass and black timber and a new collection of lights and accessories in bluestone, brass and granite. These later items include a table lamp ‘Stratosphere’, incense burner ‘Void’ and oil burner ‘Superstructure’. Page Thirty Three has grown from the humble beginnings of their laser cut plywood milk crate from 2010 to producing some really inspiring work. Their monolithic ‘Stratosphere’ light is particularly fantastic, sitting between sculptural and functional object embedded in bluestone. Page Thirty Three objects from the 'Tactile Equations' collection. 'Void', 'Stratosphere', 'Superstructure' and a version of 'Void' with granite base. Seeho Su is a supplier of a tight selection of understated furniture and lighting designs from companies such as Maruni (Japan), Molo (Canada), Neri & Hu (China), Gubi (Denmark) and Mud (Australia). The showroom recently moved from a tiny space off Bourke st Surry Hills to a more spacious and light-filled building in Devonshire Street, a few blocks down the road. Maruni furniture pieces, Molo lights and Mud Ceramics at the new Seeho Su showroom. The new showroom was finished just in time to open its doors for Saturday Indesign and to reveal their latest brand acquisition, New Works. This small Danish brand is a favourite of Design daily and you can read a full post on the brand’s relaunch earlier this year, here. Spence & Lyda (www.spenceandlyda.com.au) have been a fixture of the Sydney design scene since the late 90’s. These days they are less about mid-century modern and more about timeless contemporary design and highly crafted pieces. While this year the showroom made a political point of promoting the 350.org anti-emissions initiative on the front windows of their Chalmers street showroom to show the opposition of the design community to coal mining in the Galilee basin, they also introduced a new series of PET Lamps by Alvaro Catalan de Ocon to the Australian market. Weavers from Abyssinia at work on new PET Lamp shades. The one on the right has a wonderful constructivist flare and asymmetry in its decoration. The founder of the PET Lamp project, Alvaro Catalan de Ocon at Spence & Lyda during Saturday Indesign. This series of woven pendant lamps that are formed over recycled plastic bottles was initially conceived in 2011 and is now in it’s third collection having involved the weavers of Columbia and Chile before choosing to empower women born with twins in Ethiopia. While having twins might seem innocuous enough in western cultures, in parts of Africa it is enough for a woman to be shunned from normal society making finding work difficult. Catalan de Ocon’s third PET Lamp initiative was designed to help these women out of this predicament through gainful employment. For more information on this inspiring project go to the PET Lamps website here. 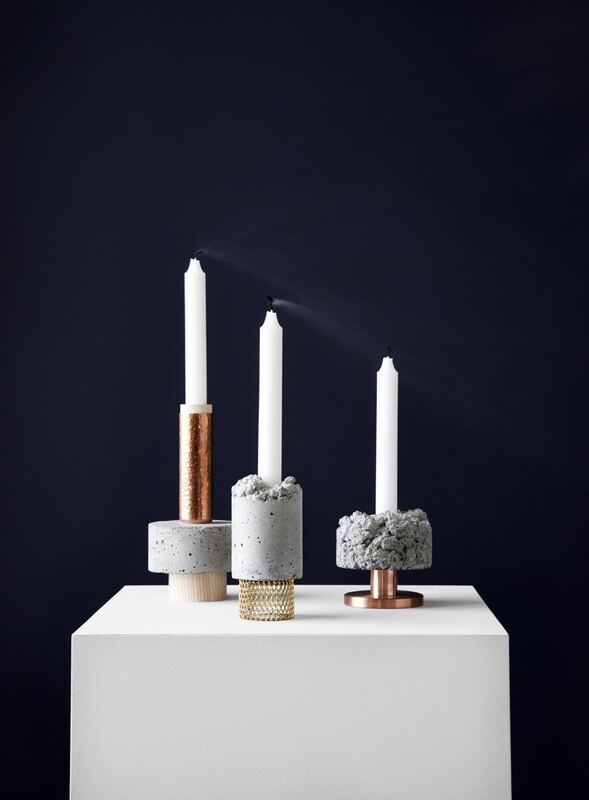 At Galleria in the wonderful locomotive workshops of Everleigh, a mix of larger building and product supplier companies rubbed shoulders with a number of Australia’s small design companies and designer makers. Lighting was represented by importers such as Light Co who represent international lighting companies like Torremato and Il Fanale, while Australian and New Zealand brands ISM Objects, Catapult Design, and Resident showed how well we are keeping up with the international competition. A moody light set-up at the Catapult Design stand at Galleria, showing lights by Coco Reynolds, Inkster Maken, Paul Townsin, Ross Didier and others. Young designers such as Dennis Abalos, Anaesthetic, DAAST and Savage Design were also on show along side small bespoke furniture workshops like JP Finsbury and Jonathan West. Dennis Abalos' new chair 'Lattice' comes in three variations and in natural or stained rattan. Jonathan West stools and dining table. Available in numerous timbers including tallowwood and walnut as shown here. 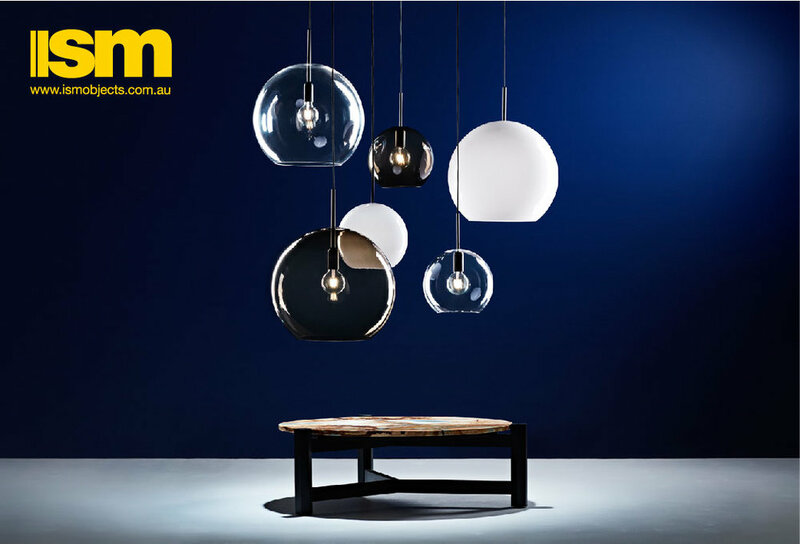 Australian ceramics designer Valissa Butterworth of The Mod Collective has recently branched out into lighting and created a range of both slip-cast porcelain and metal and glass pendant lights that are both affordable and original. New Oxley Butterworth lighting in glass and slip-cast porcelain on show at Galleria. Featuring facetted surfaces like the brand's signature bowls, the ’Marquis’ lights come in a delicious array of pastel colours while the brand’s latest glass pieces are offered in a range of Scandinavian-style tones like smoky grey, fuschia pink, tea brown and steel blue. The all glass version of the 'Hide' pendant lights by Oxley Butterworth. The glass pendants are generally either capped with spun aluminium or leather hide, creating a two-tone materiality, while one, more drawn out shape is available only in glass (as shown). The entire range is handmade in Victoria. For more go to Butterworth’s lighting website Oxley Butterworth. 'Cosse' side tables from Italian manufacturer SIPA in black stained beech, distributed by Obodo. Some new brands of note that were launched at Galleria during Saturday Indesign included Italian furniture company SIPA, whose simple affordable range of solid ash furniture bridged Italian and Scandinavian aesthetics. Available through Australian distributor Obodo, SIPA is an established maker of furniture parts in Italy that has been supplying seats and other parts to big brands like Billiani since 1974. 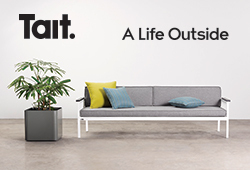 Maiori A600 series outdoor pieces by Christophe Pillet - distributed by Obodo. Obodo also launched another new brand to the Australian market – Maiori. This French outdoor specialist collaborated with Christophe Pillet on the A600 series that utilises a particularly durable form of aluminium called A6061, in a fine and uncomplicated form that should work in a wide range of contemporary outdoor applications. Minimal contemporary lighting by Ben Wahrlich for Anaesthetic. A combination of different length bars allows customers to create their own geometric arrangement. In brass or black. Tom Skeehan's new armchair from the 'Hoshi' collection bridges Japanese and Danish aesthetics. Three designer maker studios Skeehan, Anaesthetic and Inde combined to show on a common stand that while led by budget constraints showed the strength of a stand with a simple, pure idea. Made from orientated strand board, pine and river pebbles, the structure formed a low cost but very effective backdrop to the work of the three studios, with lighting from Ben Wahrlich’s Anaesthetic, three new timber seating proposals from Tom Skeehan and highly polished electroplated aluminium stools from Jonathan Ingram of Inde. Tom Skeehan's 'Stay' stool in parts. The stool is now in production with Zenith Interiors. In a quiet backstreet of Chippendale Sarah Gibson and Nick Karlovasitis have been beavering away for the last eight years to establish their brand DesignByThem. While many of the two-dozen or so designs now in production are by Gibson and Karlovasitis themselves, they have also called upon the design talents of a number of their Australian design contemporaries such as Seaton McKeon, Stefan Lie and Tommy Cehak. Looking more like a chapel than a furniture design studio, the DesignByThem workshop was cleared to make room for one of the many Saturday Indesign design talks. Recently they have also collaborated with Jon Goulder, Trent Jansen and Tom Fereday and the results have been spectacular with four new seating designs launching Saturday Indesign along with two new lights – one a range glass and timber pendants inspired by the work of Poul Henningsen created by Goulder at the Jam Factory in Adelaide, the other a large pendant of interconnecting cones in organic cotton by Jansen. Jon Goulder's 'Flip' lights in painted timber and glass, come in three shapes and a range of colours. Own World is a recently established importer that distributes furniture and lighting from Italy, the Netherlands, Belgium and the US. 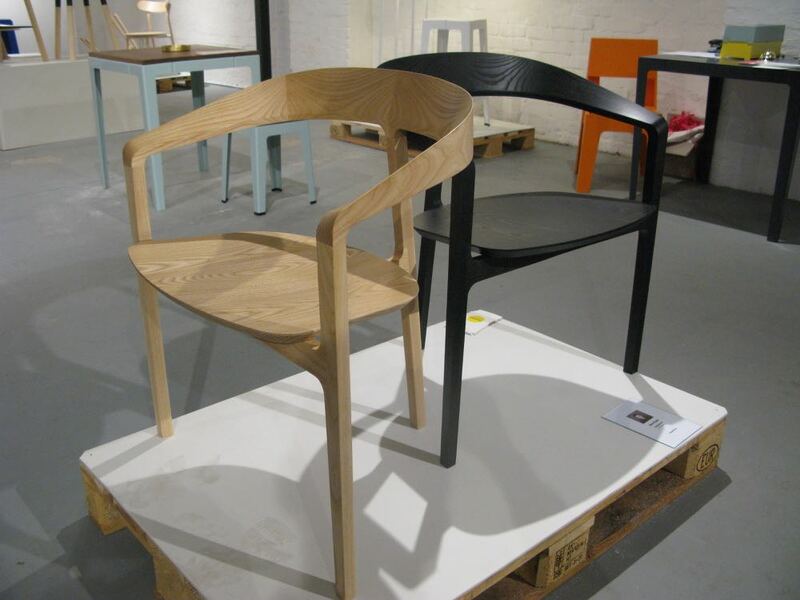 Featured during Saturday InDesign was the new production version of the ‘Langdon’ chair by local designer Chris Hardy. The solid oak and plywood chair is made in Latvia and available in either natural oak or stained walnut or black. Hardy has also designed a three-legged barstool to go with the chair. This chair is great value at under $500. Chris Hardy's 'Langdon' chair in solid oak & oak faced plywood, distributed by Own World. Another new range of note for Own World is from Bend Goods USA. This small metal furniture brand from Los Angeles has only been around since 2010 but is growing fast. The graphic wire chairs ‘Captain’, ‘Lucy’ and ‘Ethel’ ‘Bunny’ and ‘Farmhouse’ by Gaurav Nanda are a contemporary reinvention of Harry Bertoia’s wire chairs from the 50’s but offered in contemporary powder coat colours and shiny electroplated finishes. The 'Captain' chair by Gaurav Nanda for Bend. Shown with optional seat and back pads. At specialty Spanish importer, KE-ZU pride of place was given to new ranges of Expormim furniture and Parachilna lights. Jaime Hayon was responsible for numerous designs for both brands including the 'Frames' armchair and footstool and the 'Chinoz' table lamp. 'Frames' armchair and footstool by Jaime Hayon for Expormim on show at KE-ZU. Along with the new pieces by Hayon, other new Parachilna lights such as 'Anwar', by American designer Stephen Burks, were on display. Jaime Hayon's 'Chinoz' table lamp for Parachilna. With new bathroom furniture collections by Wilhelmina McCarrol (of much-loved furniture brand, Zuster) launching at Reece, I could go on and make this post even longer but suffice to say Saturday Indesign delivered the goods for anyone prepared to do the rounds. One of the new the new Issy ranges by Zuster's Wilhelmina McCarrol for Reece - the Z8 Butterfly. With the Saturday Indesign model being taken to other cities including Brisbane and Singapore in recent years, it seems set to remain a regular feature of the Australian and Asian design scene for some years to come. Will it compete in Melbourne with the newly established DEN Design & Furniture Fair? Only time will tell.